Da Greasy Guide: Worldwide: We *heart* Lesbians: Laila and Latifah. 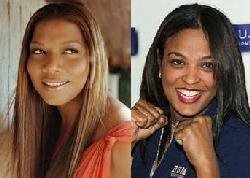 It might be fall but spring love is in the air and surrounded around lady boxer Laila Ali and the Queen Latifah. Laila Ali and her husband/manager's divorce is final. The two have been separated since January and their divorce became final November 1st. She briefly mentioned it on the red carpet of BETs 25 Anniversary show. A close friend of the boxing champ tells Atlanta Gossip, (AG) that Laila has finally come to grips with her true sexuality and is happy with her new found freedom and is dating Grammy nominated actress, rapper, singer, Queen Latifah. Latifahs rep, Amanda Silverman of The Dart Group, told EUR via phone that the e-mail is something that somebody made up and that her client is not dating Ali. I dont even think they know each other, she snapped, before hanging up. Humm...lies! The had ample time to meet and chat with each other at the BET 25th which they both attended and the Queen partly hosted. Laila has just recently divorced her husband and is single and ready to mingle. And Queen Latifah has never denied that she was a lesbian. She been connect to have been dating MC Lyte, Tachina Arnold, and Queen Pen. What's even worse is that the Queen who real name is Dana Owens is know for being rought. She like to rouch up her girls sometimes leading to a bruse here or there. You fill in the blanks on that one. If Ms. Swoops can swoop down some chocolate muffins then so can Queen and Laila.